When English tourist Meredith (Merry) Pink finds herself inadvertently locked in the Howard Carter museum in Luxor for the night, she has no idea about the thrilling Egyptian adventure she’s about to embark upon. The museum was once Howard Carter’s home, where he lived during the historic years of his discovery and clearance of Tutankhamun’s tomb in the Valley of the Kings. Attempting to break free, Merry accidentally smashes the frame surrounding an original Carter watercolour of an elusive Egyptian queen. The discovery of a hidden message inside from Howard Carter himself, together with a set of mysterious hieroglyphics sets her off on a quest to solve the puzzle of a lifetime. Along the way she teams up with the dashing Adam Tennyson, a self-proclaimed “thwarted” Egyptologist. Together they set about unriddling the ancient texts, and find themselves on a madcap treasure hunt around some of Egypt’s most thrilling locations. An exciting blend of adventure, mystery and romance, Carter’s Conundrums will demand all of Merry’s imagination and love of the fabled land of the pharaohs to keep her on the trail, and out of trouble. The idea for Carter’s Conundrums came to me while I was standing inside Howard Carter’s house near the Valley of the Kings. I had the place to myself for a while. It was quite a surreal, time-slip kind of experience. It made me wonder what secrets the place might have. So, the first book in the series starts with my main character, Merry Pink, getting trapped there. Needless to say … there’s a secret! Howard Carter’s discovery of Tutankhamun’s tomb is one of the great adventure stories of recent history. Who can resist the lure of buried treasure? Surely his find must rate as one of the most spectacular archaeological triumphs of all time. Yet Carter received no honours, no knighthood or OBE as he might have expected, either in his lifetime or afterwards. Rumours of skulduggery have persisted for close-on a century. A great theme for an action-adventure story. 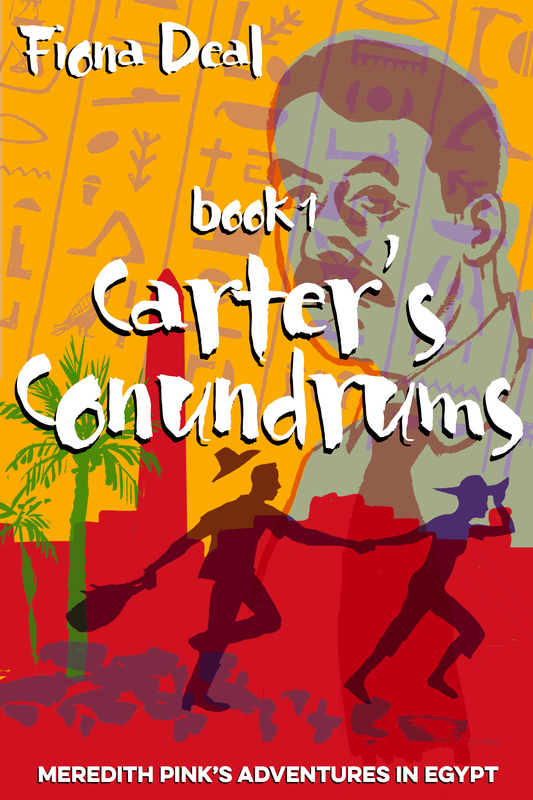 Carter’s Conundrums is meant to be a light, entertaining read; something for a sunlounger on holiday, or a cold winter’s night at home. But it’s also a bit of an exploration of a slice of Egyptian history I find fascinating. I hope you do too. I’m going again next week … it just keeps on drawing me back ! Thanks for taking a moment to comment. Dear Mrs Deal, With great pleasure I have read Carter’s Conundrums. being the Guest Relation Coordinator in the Maritim Jolie VIlle in Luxor, I was pleasantly surprised about the “home away from home” you gave Merry & Dan. I hope I can find a way to get my hands on Tutankhamun’s Triumph and Hatshepsut’s Hideaway here in Luxor. This will be my own little adventure. Thanks!! Hello Amina and thank you or your comment. I’m delighted you enjoyed Carter’s conundrums. I’ve been to the wonderful Jolie Ville a couple of times, so it seemed a natural setting for my books. The next book, Tutankhamun’s Triumph has even more of the story set in the hotel. I do hope you’re able to get hold of a copy … Otherwise I might just have to make a special trip !! Dear Mrs Deal, I have found your email address in the hotel administration and I will contact you there. I read your book during a few days holiday and started working again today. This morning I lend out my book to an English guest and already somebody else asked me if she could be the next one. I see some oppertunities here. I hope your email is still working, I will write to you today.